Ferret owners were aided at first by city councilwoman Kristine Alessio who has had experience with Savannah cat legalization issues and knew what ferret owners are facing in a hostile Fish and Game Commission and apathetic California legislature. “We were also aided by city councilman Bill Baber who sympathized with us for facing another useless and outdated law backed up by an out of touch state agency,” said Pat Wright of Legalize Ferrets. Mayor Mark Arapostathis was an outstanding ally of the ferrets and recommended a proclamation. California ferret lovers continue to be rejected or ignored by California legislators but are achieving support from cities around California. Culver City has already put the ferret issue on their city council agenda and ferret lovers are next set to ask the Encinitas city council. 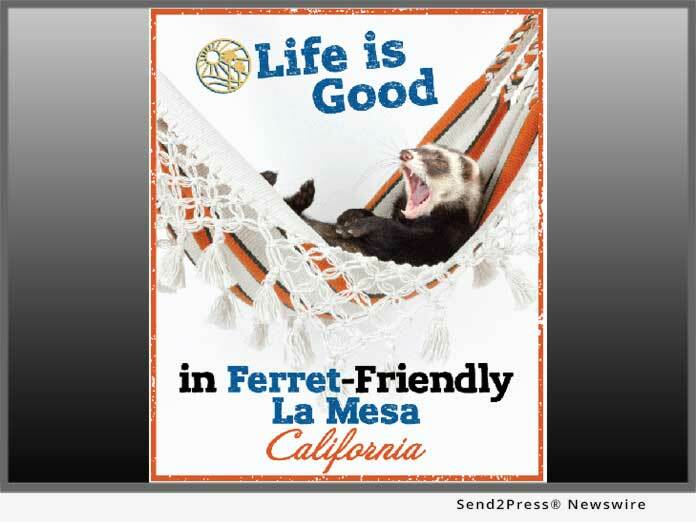 Now that we have this proclamation we are set to ask cities around California to adopt the ferret friendly resolution. "We are also grateful to City Councilmen Guy McWhiter and Colin Parent who agreed with the absurdity and cruelty of California's anti-ferret law and signed on to the proclamation," said Pat Wright. Legalize Ferrets is a California not-for-profit organization that started in 2005 because we saw a lack of progress in the effort to legalize ferrets in California; and the org continues to advocate for ferret legalization in the state today. California remains one of only two states to continue to ban domestic ferrets as pets; the other state is Hawaii. If you are interested in ferrets in California – consider joining us. Together we’ve been able to accomplish so much and we hope the day we can take our ferrets outside without fear is close at hand.